History: Originally part of U.S. 180 (I), then renumbered NM-180 and NM-90. In 1988, the segment of NM-90 east of Silver City was renumbered to NM-152. Comments: Crosses Emory Pass in the Black Mountains, the physical barrier that prevented U.S. 180 (I) from being a continuous route during its existence. History: Established probably in 1988. History: The level of detail for this short route makes the exact routing --- and thus the history --- a little uncertain. I believe this is the western leg of former NM-140, which for a time went from Hatch east to Rincon and then south to U.S. 85. The south leg is still NM-140. History: Established mid-1930s. Essentially unchanged in routing and designation since that time. Improvements: 2-lane, paved road except for a gravel section near Luciano Mesa in the middle part of the route. History: Originally part of NM-78 since mid-1930s. This route was cut back, probably in 1988. Improvements: Paved, two lane road west of Mogollon, gravel east of there. History: Established in the 1950s. 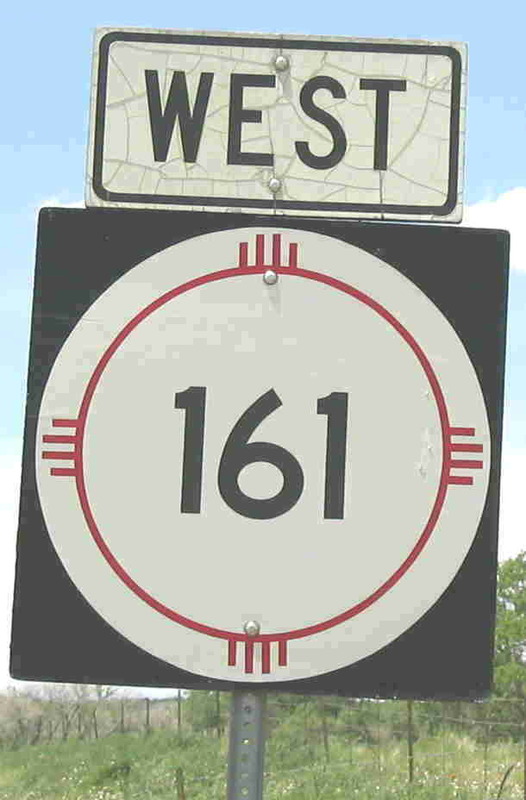 Renumbered NM-161 in 1970 when U.S. 160 was established in New Mexico. History: Established mid-1930s. The alignment was shifted more westerly thereafter, and by the late 1940s it was redesignated as an extension of NM-41. This was removed from the state highway system by the 1960s and is now county road. Taken at the south junction with I-25 (exit 364). Note tha the directional sign is much older (cracked reflective background) than the route marker. History: The west leg of this U-shaped route was renumbered from NM-160 in 1970. In 1988, it was combined with NM-477 and whatever the frontage road along I-25 was called then to form a continuous route. Comments: This was one of the more bizarre outcomes of the 1988 renumbering. Yes, it's a continuous route, but it almost turns back on itself. Worse, it creates confusion from two closely spaced exits along I-25, both numbered for NM-161 and identically signed (NM-97/NM-161/Watrous/Valmora). There was really no reason under the criteria used for that renumbering to change NM-477, and it would have been more logical to extend NM-161 along what is now NM-97. History: This was originally designated in the 1930s as NM-145 before being combined into NM-78. the eastern leg of which was broken up in 1988. (A more westerly segment of old 78 is NM-159). History: This route, like NM-56, has a confused history with 1930s era route NM-35. This is shown on a 1936 map on the same route that before and after that time is shown as NM-35. It's possible, though, that NM-35, as is shown on a 1926 map, actually went from Gallup to Crownpoint until being routed onto this road in the mid-1930s. At any rate, later became NM-56 and NM-57, and it is now the southern end of NM-371. Taken May 2005 at foot of Sandia Peak (junction with 536). History: This route was established in 1985. It was formerly the eastern part of NM-44, and I remember that number being removed from this route in the 1970s. Comments: The sign for NM-536 is just to the left of the sign shown at left, and is shown under the NM-536 listing. It isn't nearly as faded as this one, which suggests this sign is probably an original. .
History: Probably established 1988 or thereabouts. Just a connecting road to the VLA Visitor Center. It may have been a part of old U.S. 60 before it was relocated. Comments: If you're not aware, the VLA is a series of huge, huge radiowave receivers pointed into space looking for messages from out there. The receivers are aligned so they act as one unit. This road is actually a piece of original U.S. 60, realigned long ago. No history of state routes with these numbers found. History: Created in the 1940s as an extension of NM-52, though the road was much shorter. It was extended in the 1960s and in 1988 was renumbered. Comments: Serves the Alamo Band Navajo Reservation. This band is the southeasternmost group of Navajo. Looking at this route suggests why today's NM-47 from U.S. 60 to near Belen (formerly NM-6) was originally designated NM-52. There may have been a plan in the 1930s to eventually extend this route east from where it ends now to Belen and connect to that road. History: Established mid-1930s, originally part of that hard-to-characterize route NM-35. It soon became an extension of NM-17 and kept that designation until U.S. 64 was extended west to Farmington over NM-17 around 1974. History: Established 1940s. By the mid-1950s, NM-57 west of Buyeros was removed from state system, and NM-171 and the remaining piece of NM-57 became part of NM-102. History: The original routing of NM-52 east of U.S. 85, beginning probably in the 1920s. By the 1950s, this road had been bypassed by a new alignment of NM-52 further north, and this road was removed from the state highway system. In the 1988 renumbering, it was reestablished as a state highway, probably because it provides access between I-25 and the city of Elephant Butte and the reservoir. History: Established early 1940s, originally ran down what is now NM-575 to Blanco. This route was the original alignment of NM-44 in the 1930s until that route was realigned along old NM-55 south of Aztec. In the 1960s, it was routed east to NM-511 at Navajo Dam. Comments: One map from the mid-1970s shows both the new eastern extension to Archuleta and the original southeast segment as NM-173. That indicates this may have been a T-route for a few years. History: Established 1930s, within a few years became the present alignment for NM-53, which originally ran further west to U.S. 66. History: Appears to have been established around 1988. History: Established before 1988, because of its number. Serves as an access road from NM-8 for a refinery and associated natural gas processing facilities out there in Little Texas.